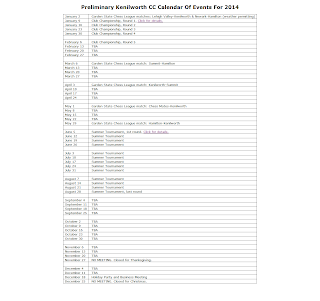 A preliminary calendar for 2015 has been posted on the club's website. Approximately 20 dates, mostly from Jan. 8-Mar. 12 & Sep. 10-Nov. 19, have been left open. If there are certain events that you'd like the club to run, mention them to President-Elect Bob Sherry, who takes the reins on January 1st, & the other officers. Speaking about officers, aside from Mike Goeller being nominated and seconded for the Webmaster position, there has been little progress toward filling the 4 vacancies. At the December 18th Business Meeting, a Secretary was elected but I still have not heard if he is willing to serve. With the email meeting not really working, I strongly suggest that business discussions be re-opened when club meets in person on January 8th. 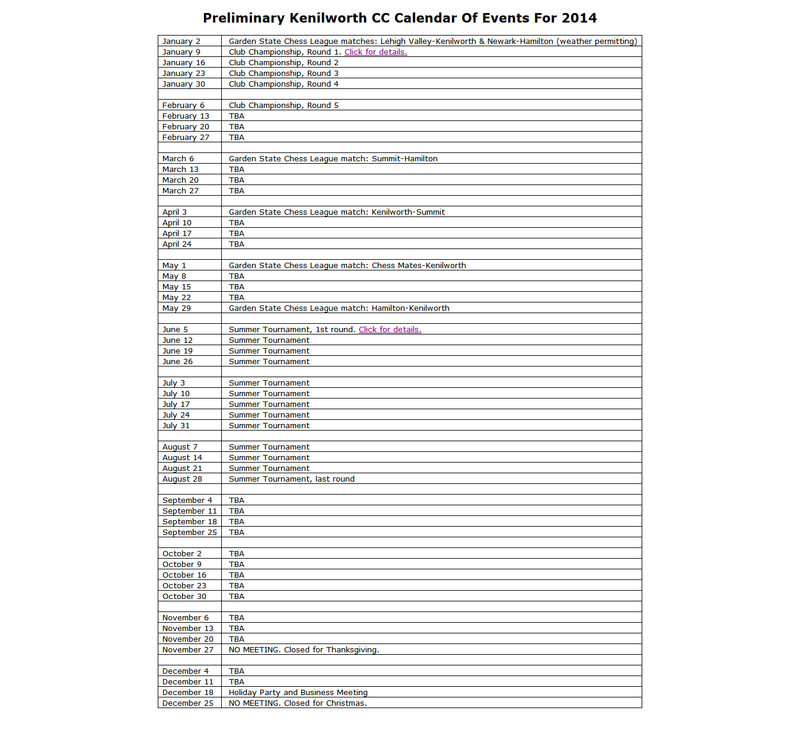 The time control for the Club Championship needs to be confirmed, too. Well, my time as KCC Prez is nearing a close. I'm not sure how often I'll be attending the club this winter, but I hope to keep (err.. make that resume) playing for our GSCL team and enter the Club Ch. in the spring. Tonight LM Scott Massey will be giving a lecture on last month's Carlsen-Anand match. May 1st will be used a make-up date for those who were unable to play last week. The 4th round has been canceled.